Now that spring has sprung, the flowers aren’t the only things in bloom. It’s time to liven up your home and brighten things up. The first place to start? Let’s go with the kitchen. There are several things that you can do to bring new life to this area of the house. Getting creative with color is one of the easiest ways that you can make a big change is with the kitchen cabinets. You don’t have to stick with those plain, wooden industrial grade cabinets. Giving them a fresh new coat of spring-inspired paint will make the room feel bright and inviting. So let’s dive into the color options that you can explore and how you can give your kitchen a new look. Soft blues can give a room an elegant touch. While warm grays will create a more sophisticated look. Here are some color combinations and suggestions that will give your kitchen a modern and contemporary look that will make it feel comfortable and airy throughout the year. 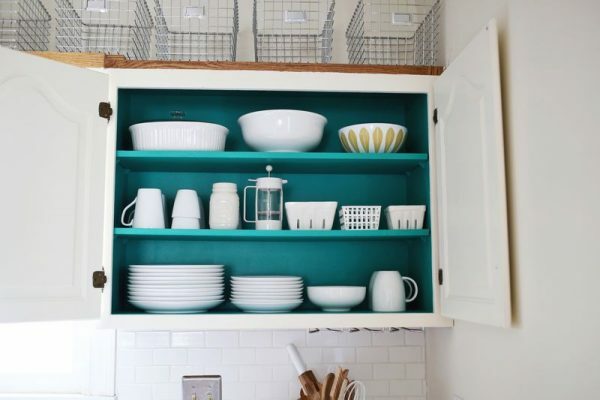 You don’t have to paint your cabinets using only one color. Using two different colors from the same family can add visual interest and depth to the room. 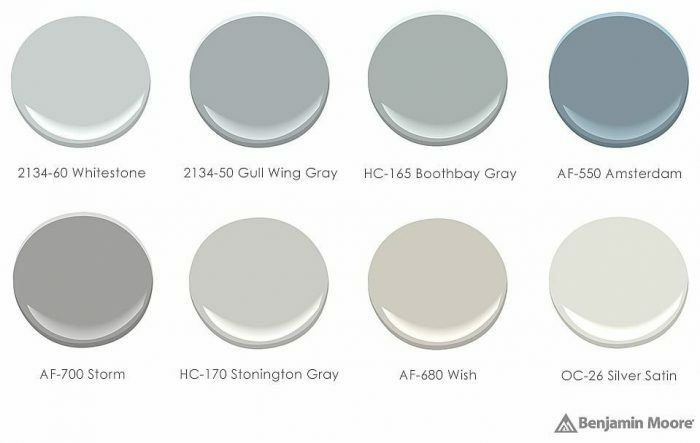 Pairing a classic gray such as Gull Wing Gray from Benjamin Moore with a lighter hue as an accent will make the kitchen feel cool, yet inviting. If your style leans more towards the bohemian, then you may want to bring that into the look of your kitchen. Painting the cabinets white will make the kitchen appear larger and brighter. But what if you don’t want to don’t want to use stark white? That’s understandable. Try using a washed out off-white or eggshell paint color. Benjamin Moore has a large selection of whites that are not so white. From their White Dove to White Heron, these colors are classic and contemporary enough to keep up with the times. There are certain colors that will contrast well with lighter colors. 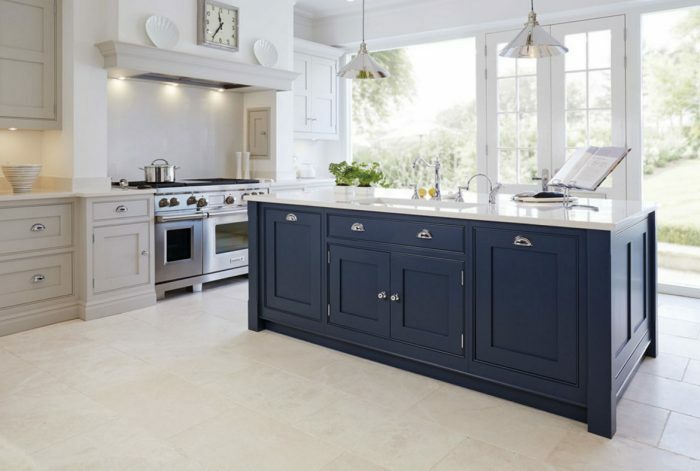 Deep, rich royal blues paired with vibrant white cabinets can make your kitchen look luxurious. Remember that you don’t need to paint your cabinets the same color. 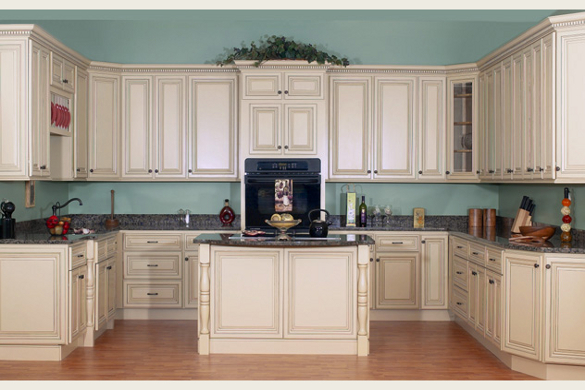 Painting the top cabinets in a lighter color and the bottom cabinets in a darker shade will create balance in the room. Maybe you prefer for your kitchen to have a little more character. White cabinets offer a modern, fresh look that is bound to brighten up any space. There’s more you can do though to give these white cabinets some pizazz. Using turquoise and seafoam green for the interior cabinet walls will give them a touch of brightness that will draw the eye. Now that you have a few paint color ideas, it’s time to get to work. Once you know what new color or colors you want to paint the cabinets you can get down to the nitty-gritty. Here are some techniques that you can use to make the process quick and easy. First things first. Before you pull out the brush, you’ll need to remove any hardware that is attached to the cabinet doors and drawers. You also need to remove the hinges as well so that it’s easier and less time consuming to paint the surface. This will prevent them from being covered with paint or damaged during sanding. Should You Use a Brush or Roller? While rollers are perfect for walls, they are not so great for cabinets. You would be better served to grab a good paintbrush and paint the cabinets with it. Cabinet doors and drawers often have uneven surfaces which make it more difficult to put a smooth coat using a roller. It might be tempting to set up a painting station on your countertops, but that can lead to you finding some unwanted globs of paint on them later. Consider setting up a worktable in the kitchen that is large enough to hold the cabinet doors. You can use a couple of 2×4’s and place them on top of sturdy boxes or upturned buckets to make the table. This will make for an easier cleanup and keep your countertops safe from specks of paint. Before you start painting, you want to make sure that the surfaces are nice and clean. You’ll need to go in with a heavy-duty all-purpose cleaner and scrub the surface. By removing all excess grease and grime, the paint will be able to adhere to the surface. It’s not uncommon to notice cracks in the wood of the cabinet doors. After years of opening and closing, chances are high that there are some very apparent signs of use. You can easily fix these by using caulk to fill in gaps and cracks. Wood glue can also be used for larger holes and to reattach any wood that may have chipped off. One of the most important steps that you’ll need to take before giving the cabinets an update is to sand it down. This will help the paint stay on the exterior and not show any streaks. There are some people who will prime their cabinets before painting, but it’s recommended to take the time to sand off the varnish instead for a more even finish. Creating an open and inviting kitchen will help make your home feel airy and bright. While painting the cabinets is more time and labor intensive, there are things that you can do to make the process easier.